JRF/SRF Vacancies – Last Date (Interview) 08 February 2019 (Chandigarh, Punjab), Central Scientific Instruments Organisation (CSIO) recruits Junior Research Fellow/Senior Research Fellow Posts. Candidates with M.Sc., M.E./M.Tech., NET/GATE qualified experienced can apply. (a) For JRF: Essential Qualification: M.Sc. in Physics/ Applied Physics/ Photonics/ Opto-electronics or equivalent5 with NET/GATE qualification OR M.E./M.Tech. in Applied Optics/ Photonics/Optical Engineering/ Opto-electronics or equivalent5 (b) For SRF: Essential Qualification: M.E./M.Tech. in Applied Optics/ Photonics/Optical Engineering/ Opto-electronics or equivalent5 plus two years of research experience in relevant field after acquiring essential educational qualification OR M.Sc. in Physics/ Applied Physics/ Photonics/ Opto-electronics or equivalent5 with NET/GATE qualification plus two years of research experience in relevant field after acquiring essential educational qualification. Interested candidates must register between 9:00 AM to 12:00 Noon. Entry will not be allowed after 12:00 Noon. 1. The performance of the candidates selected against all the above mentioned positions will be reviewed every 6 months and based on the performance as per the project mandate, further extension will be provided from time to time. 2. The candidates who have already served CSIR-CSIO or any other lab / institute of CSIR as any Project Assistant / Project Fellow / JRF (in contract R&D projects) / SRF (in contract R&D projects) / Research Associate etc. for a total period of 5 years or more are not eligible for these engagements. The candidates who have served for a period less than 5 years will have tenure upto remaining period till completion of five years. 3. Medical Facilities for self will be provided through CSIR-CSIO Dispensary only to the extent available as per rules. This will be limited to self only and not for family members/dependents. 4. Reservation: As regards reservation, if all things are equal, SC/ST/OBC/PH candidates may be given preference over General candidates so as to ensure their representation. 5. In case a large number of candidates turn up for Walk-in-interview, Selection/Screening Committee will have discretion to shortlist the candidates for interview based on written exam or percentage of marks. In respect of equivalence clause in Essential Qualifications, if a candidate is claiming a particular qualification as equivalent qualification for recruitment as per the requirement of advertisement, then the candidate is required to produce order/letter in this regard, indicating the Authority (with number and date) under which it has been so treated otherwise the Application is liable to be rejected. 6. List of selected candidates will be displayed on website. In addition, general panel will also be drawn for future requirements and it will be valid for one year. 7. The selected candidates are expected to join within fifteen days from the date of receiving offer of appointment, after completion of pre-appointment formalities like medical examination and character verification etc. 8. The selected candidates will have to deposit an amount equivalent to Fifteen Day’s stipend as a Security Deposit (Refundable) with CSIR-CSIO, at the time of joining. 9. 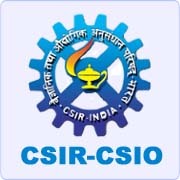 CSIR-CSIO reserves the right to cancel or withdraw the award in case of any discrepancy found, in the candidature of any selected candidate at any stage. 10. CSIR-CSIO reserves the right not to fill up a particular position, if it so desires. The number of vacancies indicated above may vary at the time of actual selection. 11. No TA will be paid to the candidates for attending the interview. 12. The engagement as a Research Intern (RI) under the ‘CSIR Diamond Jubilee Research Intern Awards’ Scheme is purely on temporary basis. The Intern shall have no claim for further extension, absorption or regularization in CSIR after the expiry/termination of the Internship. The engagement can be terminated by either side by giving one month’s notice OR stipend in lieu thereof without assigning any reasons. It is not a CSIR-CSIO appointment and will not confer any right on the incumbent to any claim implicit or explicit on any position. 13. All the above positions in CSIR-CSIO are purely temporary contractual engagement co-terminus with the projects. The number of vacancies indicated above may increase/decrease. 14. Other terms & conditions will be governed as per guidelines issued by the funding agency/CSIR for the engagement of above Project Staff/RI as amended from time to time. 8th February, 2019 (Friday) at 8:00 a.m.
Central Scientific Instruments Organisation (CSIO), a constituent unit of Council of Scientific & Industrial Research (CSIR), is a premier national laboratory dedicated to research, design and development of scientific and industrial instruments. It is a multi-disciplinary and multi-dimensional apex industrial research & development organisation in the country to stimulate growth of Instrument Industry in India covering wide range and applications. CSIO is a multi-disciplinary organization having well equipped laboratories manned by highly qualified and well trained staff with infrastructural facilities in the areas of Agrionics; Medical Instrumentation and Prosthetic Devices; Optics and Cockpit based Instrumentation; Fiber/Laser Optics based Sensors & Instrumentation; Analytical Instrumentation; Advanced Materials based Transducers etc. Large number of instruments ranging from simple to highly sophisticated ones, have been designed and developed by the Institute and their know-hows have been passed on to the industry for commercial exploitation.